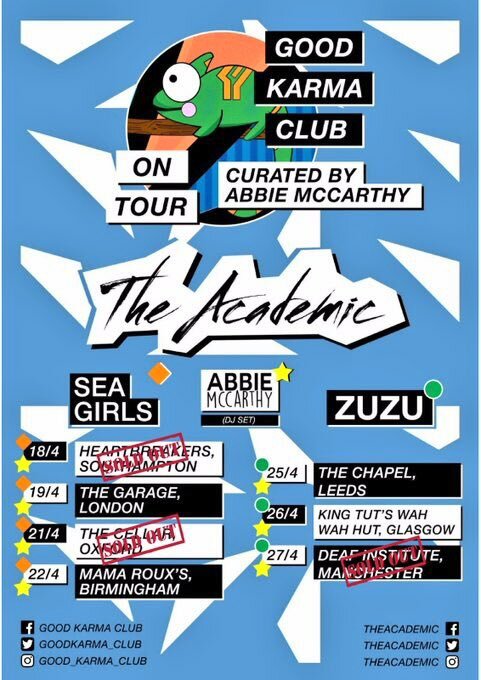 On Sunday 22nd April, The Academic perform live at Mama Roux’s, with a support from Sea Girls and a DJ set from Abbie McCarthy. Doors open at the Digbeth venue from 7pm, with tickets priced at £9.90 (plus bf) – as presented by Good Karma Club and Birmingham Promoters. For online ticket sales, click here. To visit the gig’s Facebook Event Page, click here. Hailing from Miullingar in County Westmeath, Ireland, The Academic have been firmly embedding themselves into international tour circuits, radio playlists, and music media column inches (or whatever the digital equivalent is… URL rankings?) over the past couple of years. Forming in 2013, started by school friends Craig Fitzgerald (vocals, guitar) and Dean Gavin (percussion), The Academic embraced Matt (guitar) and Stephen Murtagh (bass) and signed with Global Publishing in 2015 – releasing their debut single, ‘Different’, the same year they joined the media conglomerate that owns half the broadcasters in the UK. Or is it all of them, we lose track. But it wasn’t a bad move for a band who seem to sneeze out uber catchy indie rock, with strong and addictive melodies that scream the more credible end of RADIO FRIENDLY. An easy win for ‘one to watch’ listicles, The Academic needed to follow up their post-signing momentum with an album and something to drag the rest of the musical landscape into their world. So, in a stroke of genius that sits somewhere between The Matrix and OK GO’s treadmill choreography, they did just that – releasing Tales from the Backseat in January 2018, and deconstructing the first new single from their debut LP using Facebook Live’s 10 second delay as an AV loop. OK, perhaps the latter doesn’t sound that exciting. But click here or watch the video below and if you’re not laughing, clapping, or singing along by the end of it then you’re probably a bit dead on the inside. Sheer brilliance, sheer joy. Well done lads. Joining The Academic at Mama Roux’s, and for just over half of their Good Karma Club UK tour dates, are Sea Girls – the indie rock four piece who are neither afraid of CAPITALS LETTERS or ‘apologetic about a bold chorus, especially one that can be sung in unison by thousands of fans together of all walks of life’. But if you’ve got it then flaunt it, and Sea Girl’s lead singer, Henry Camamile, has the kind of honey dripped husky vocals that are hard to escape from. Plus, this is another band that can churn out tracks that bite down like a bulldog – for a good case study on this, check out Sea Girl’s latest single below, ‘Eat Me Whole’. If you need more, then you can skip your fingers over to that iTunes logo on your taskbar (other music sites are available) and grab a copy of Sea Girl’s latest EP, Heavenly War. Not a bad way to spend your bus fare. Rounding off an already damn fine Sunday night, there will be a DJ set from Abbie McCarthy – the brains and brawn behind Good Karma Club, and the presenter of BBC Introducing Kent. McCarthy often steps in for DJs on Radio One and is somewhat of a smarty-pants-know-it-all when it comes to solid, new music. So, having her behind the decks (or whatever the digital equivalent is…) at Mama Roux’s, as well as curating and promoting the gig, is a pretty wise idea. The Academic + Sea Girls perform live at Mama Roux’s on Sunday 22nd April, with a supporting DJ set from Abbie McCarthy – as presented by Good Karma Club and Birmingham Promoters. For online ticket sales, click here. To visit the gig’s Facebook Event Page, click here. Abbie McCarthy, Andrew Noswad, Bear Claws, Birmingham, Birmingham Preview, Birmingham Promoters, Birmingham Review, Bite My Tongue, Call Me Out, Chalk PR, Craig Fitzgerald, Daisy Daisy, Dean Gavin, Different, digbeth, DJ set, Downtown, Eat Me Whole, Ed King, Ed King 2210, Fake ID, Favourite Colour, Girlfriends, Global Publishing, Good Karma Club, Heavenly War, Henry Camamile, I Feel It Too, live, Loose Friends, Lost, Mama Roux’s, Matt Murtagh, Northern Boy, Oli Khan, Permanent Vacation, Review Publishing, Room 6, Rory Young, Sea Girls, Stephen Murtagh, Sunday 22nd April, Tales from the Backseat, Television, The Academic, What For, What You Eat, Why Can't We Be Friends?